Jan Jansz. van der Heyden was a painter and inventor, focusing his artistic activities on urban views and to a lesser extent on landscapes and still lifes. It would seem that he started painting in the 1660s and was most active between 1664 and 1678, while most of his views of cities with their streets, canals, squares and buildings date from 1666 onwards. Van der Heyden was, however, best known among his contemporaries for his inventions and improvements to street lighting and for his designs and machines for extinguishing fires, most notably a pump system that was a notable contribution to this field. He also published a manual on procedures and methods of fire extinction. In his urban views each element, however small, is painted with the same precision and delicacy, qualities that make his works unique.Van der Heyden skilfully combined real images with other imaginary elements that he fused in a natural manner in compositions characterised by their spatial clarity. His forty or so landscapes generally depict woods and views with rivers, using effects of light and atmosphere similar to those found in his urban views. Critics have suggested that the artist may have used lenses or mirrors to achieve the remarkable degree of perfection found in his works. Crossroad in a Wood depicts a lively, rural scene with passers-by and hunters as well as other figures engaged in their daily tasks. The viewer’s attention is directed towards a crossroad on the dusty highway, located slightly to the left and depicted using a high viewpoint. Van der Heyden includes a screen of trees parallel to the lower edge of the panel, broken in the centre by a road that continues into the background, the form of which is emphasised by the light that reaches the scene from the horizon. Effects of light are also used to introduce the viewer into the composition in the form of an area of shade in the immediate foreground that covers part of the path, along which a man seen from behind is walking towards the principal highway, which is brightly lit. On the left, Van der Heyden opened out the landscape by the roadside with a building surrounded by a solid wall and a rustic wooden fence. A balancing element on the right is the small house whose inhabitants are depicted looking out of the window, busy washing clothes in the river or peacefully fishing beside a bridge that links up with one of the roads. It has been suggested that this scene is based on an area near Haarlem known as Haagse Bos. Van der Heyden knew this area as on various occasions he depicted the Huis ten Bosch (House in the Wood), a palace designed by Pieter Post in 1647 and whose decoration was entrusted to Cesar van Everdingen, Gerrit van Honthorst and Jan Lievens, among others. One of Van der Heyden’s views of this palace is now in the National Gallery, London. On the other hand, the panel may depict an imaginary landscape. The present panel is a fine example of the artist’s painstaking and meticulous technique with its attention to detail. 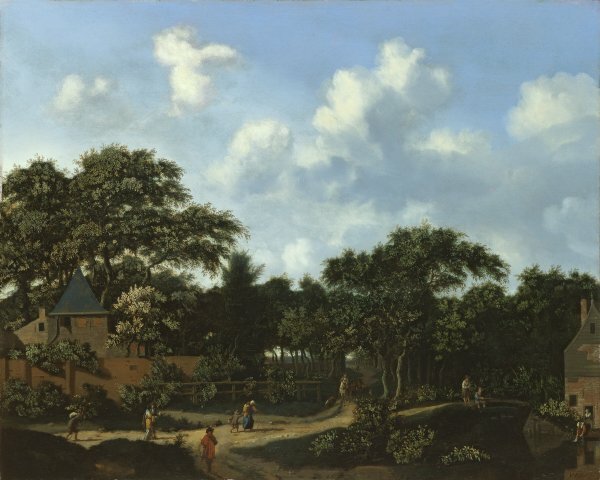 A typical feature of Van der Heyden’s work is the manner in which the bricks are painted, as can be seen in the two buildings. Discussing the artist’s manner of painting bricks, Houbraken noted that, “one can see the mortar in the joins”. This highly detailed approach is also evident in the extensive crowns of the trees in which every element is painted in individual detail, creating an overall effect of dense foliage. This interest in conveying the detail in specific areas of the composition does not, however, impede the creation of an overall sense of atmosphere, achieved through the handling of light and shadow. For the figures in his works Van der Heyden turned to Adriaen van de Velde, although it is possible that in the present panel he painted them himself.